Although its stunning beaches and hidden islands are slowly being discovered by adventurous explorers, some of the most spectacular waterfalls in Thailand still remain closely-guarded secrets to the tourism industry. For lovers of nature and photography, nothing is better than the cascading avalanche of white water crashing among the limestone rocks of Thailand’s jungles. 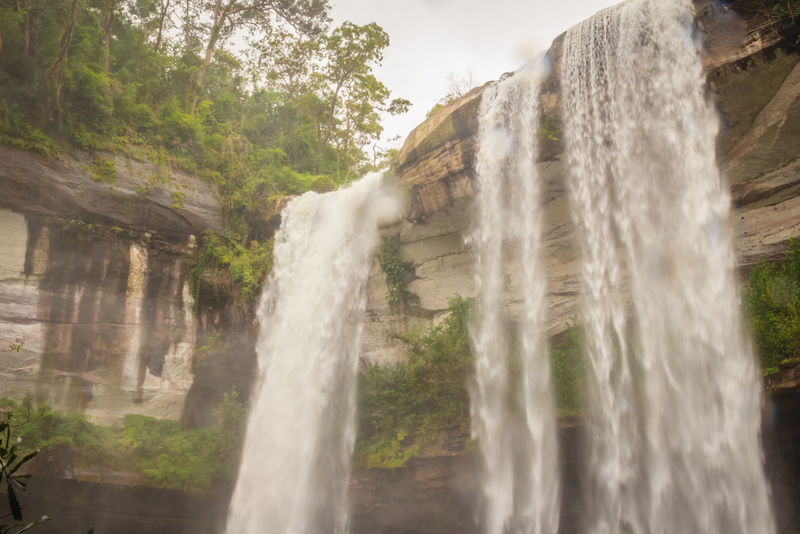 We’ve put together this list of our favourite waterfalls, all of which remain relatively secluded – despite their breathtaking allure. Whether you’re looking for the most mighty places waterfall in Thailand, the set of a famous film, a hidden jungle beach or a candlelit dinner you’re sure to find something unmissable! Some say that this is the most beautiful waterfall in the land, but you’ll have to find them first! 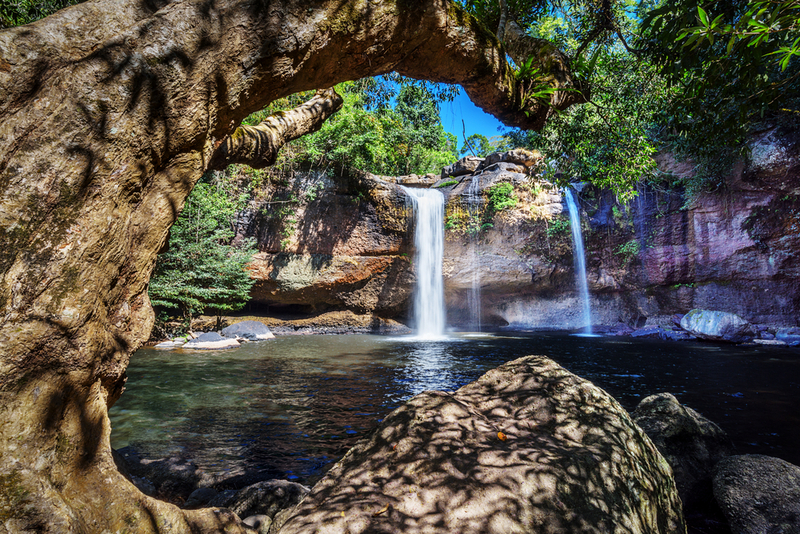 The glorious Thi Lor Su is among the most hidden waterfalls in Thailand. A limestone waterfall over 300 meters high and 500 long, it is located in Um Phang Wildlife Sanctuary of the Tak Province. You will be greeted by a loud rumbling sound from within the lush, dense rain-forest. Here, clouded leopards and tapirs roam below the 1,300 different types of palm trees. Challenging to find but breath-takingly impressive, the waterfalls at Thi Lor Su make our list of the top waterfalls in Thailand for their sheer size and magnificent beauty. Ready for an adventure? Location: Um Phang Wildlife Sanctuary, Um Phang District, Tak Province, Thailand. 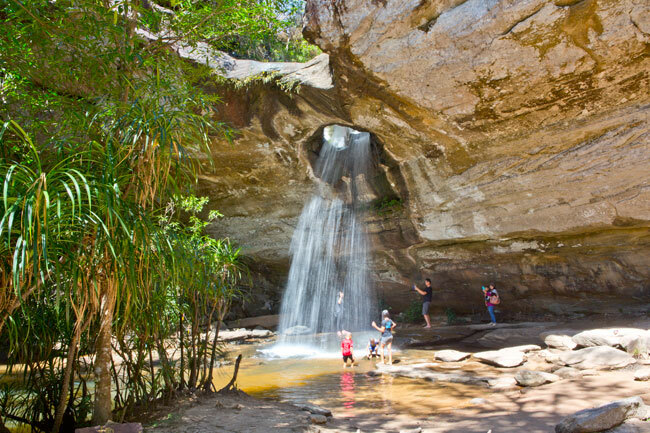 Another of the most secret hidden waterfalls in Thailand is Saeng Chan of Ubon Ratchathani. What makes this waterfall unique? It cascades not over the edges of a rock-face, but through a giant hole above! 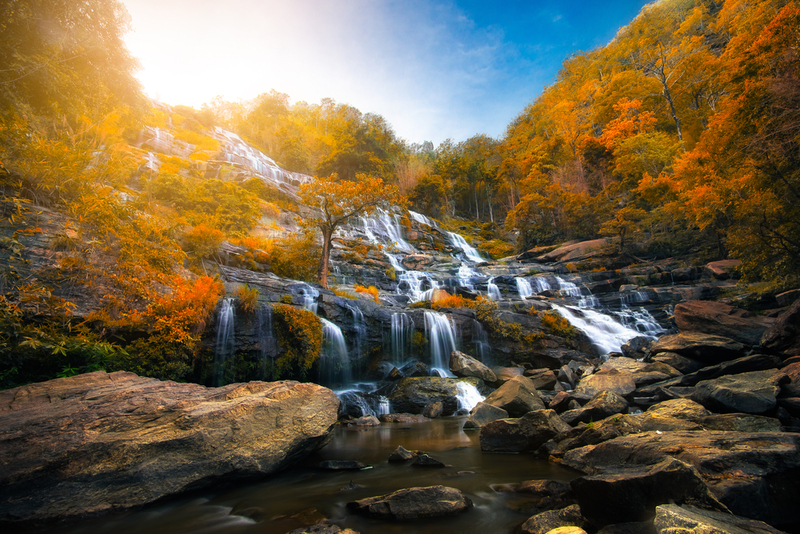 The waterfall and surrounding scenic views make for a mesmerizing experience, perfect for Instagram shots and photography enthusiasts. You should be lucky enough to have the place to yourself, and although there is a sign reading ‘Tickets,’ it is rare to find anyone enforcing an entry fee. The brave should visit at night, when the reflection of moonlight in the pool below makes for a truly enchanting spectacle. Location: Baan Thung Na Muang, Na Pho Klang Subdistrict, Khong Chiam, Thailand. Recognize this scene from anywhere? Think Leonardo DiCaprio, making the plunge across this waterfall twenty minutes or so into the hit film The Beach. Unlike Maya Bay, which occasionally has to close due to its popularity, you can still have Haew Suwat waterfall to yourself if you visit before midday. One of the top waterfalls in Thailand, it is just two hours from Bangkok – one of the more accessible on our list. Visitors are still permitted to take a dip in the pool below and the short walk from the road is suitable for families. Therapeutic and perfect for nature lovers, this one is certainly worth a visit. Location: Khao Yai National Park, Pak Chong, Thailand. 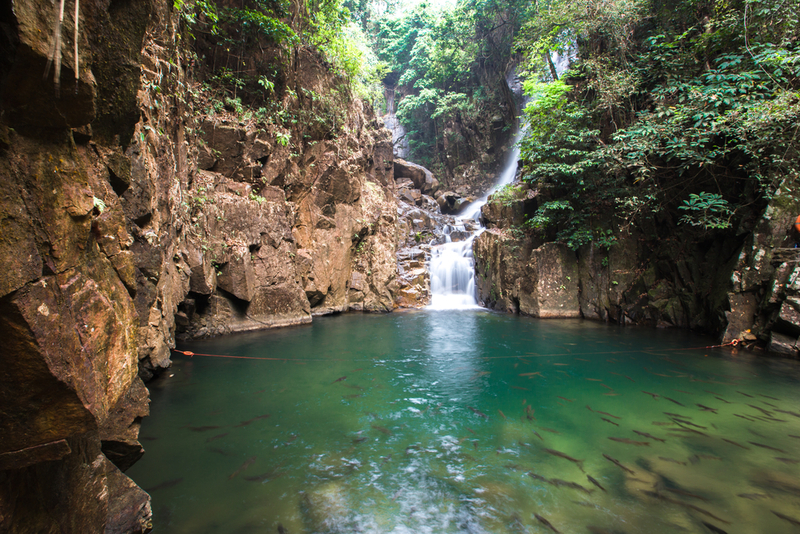 One of the top waterfalls in Thailand, Phu Sang is serene and relatively unknown hidden gem. Set near a rural highway, this waterfall flows through a picturesque, narrow valley which is adorned with lush jungle on both sides. And the icing on the cake? It originates from a hot spring – the water’s warm! This natural attraction strikes a balance between accessible and serene. A beautifully maintained garden separates it from the road, where you can order from small food and drink stores which provide picnic mats. The choice of cool or warm bathing pools for a quick plunge make this the ideal stop for a few hours for those in Chiang Kham or Thoen. 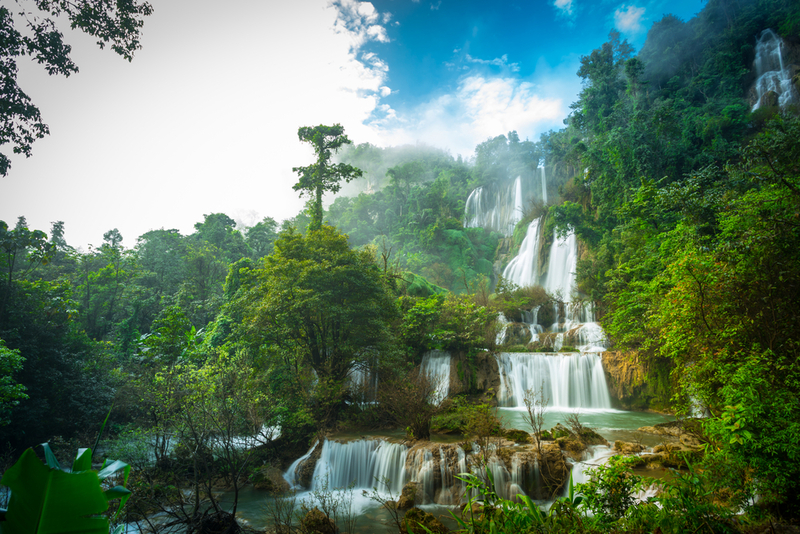 Among the most spectacular waterfalls in Thailand is Huay Luang. A majestic 45-meter high cascade of emerald water complete with – wait for it – a secluded golden beach in the middle of the jungle. It feels like something from a movie! Gloriously scenic with stunningly vivid colours, this waterfall is a dream for artists and photographers – it’s one of the most beautiful you are likely to come across. The beautiful green pool is perfect for a swim whilst you soak up the atmosphere. Chanthaburi is home to stunning beaches, but don’t spend too much time there – you wouldn’t want to miss out on one of the most spectacular waterfalls in Thailand! 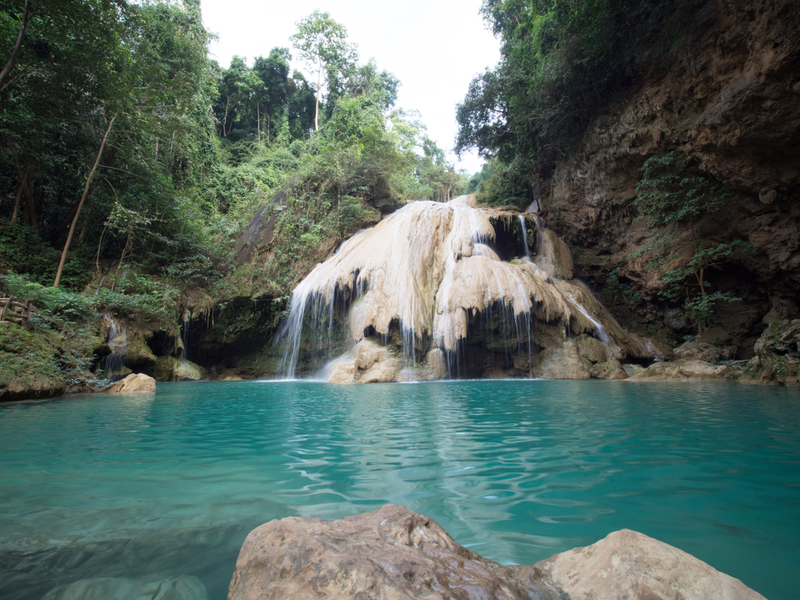 Scenic and gorgeous yet totally secluded, a visit to Phiu Waterfalls is a chance to see nature at its most pleasant and peaceful. The stunning green basin below this waterfall is surrounded by exotic jungle and teeming with fish, making this national park a perfect day out. Beautifully maintained and organized, it is the ideal place for a stroll among the beautiful forest landscape. And of course, it remains relatively unknown! 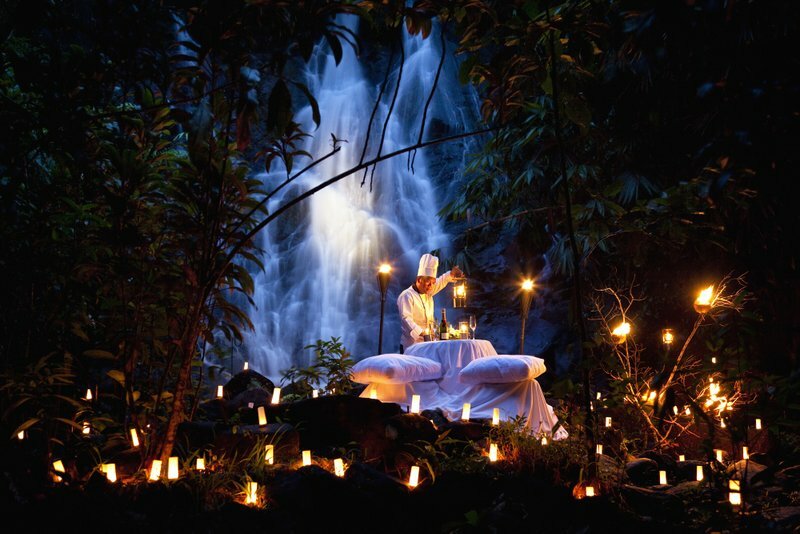 Every dreamed of a candlelit dinner beside a mystical, cascading waterfall? 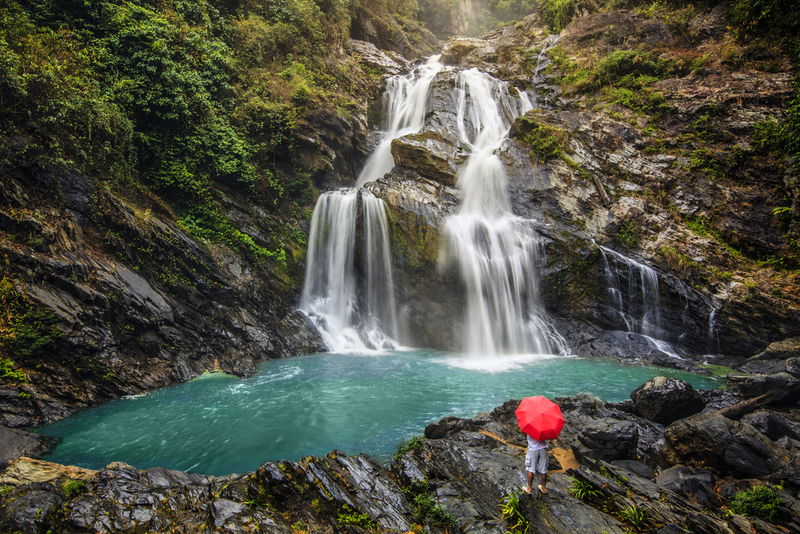 A truly unique find for romantic couples and newlyweds on a blissful honeymoon is the Sai Rung Waterfall at Khao Lak. 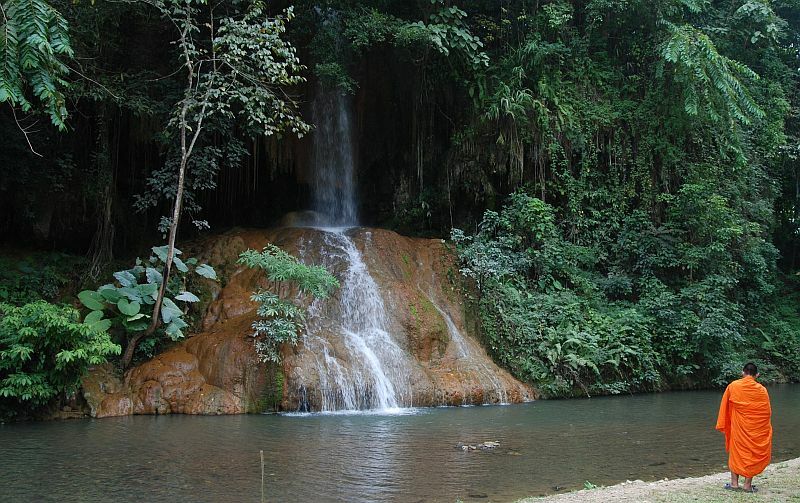 Also known as the rainbow waterfall, during the day it is the perfect setting for a swim and a picnic. However, it is in the evening that this becomes one of the most spectacular waterfalls in Thailand. An unbearably romantic spot, we don’t know anyone who would resist the urge to choose this place for a proposal! You don’t have to be a budding geologist to appreciate the stunning natural beauty of the stalagmites and stalactites in the caves surrounding Koh Luang Waterfall in Lamphun – it’s one of our top waterfalls in Thailand! The waters here originate from streams which emerge from nearby lime caves, which is what gives the water its wonderful deep shade of teal. Perfect for a swim, the peaceful atmosphere here is typical of such hidden gems. Enjoy it quickly, as it will certainly become much more popular when everyone else finds out about it! It’s not always easy to compare how beautiful the hidden waterfalls in Thailand are, but this one is undoubtedly up there. So picturesque that it’s featured on the 1000 baht note, you’d be hard-pressed to find a more alluring scene! The seventh tier is home to a viewing platform and a pool where you can swim beside the harmless fishes, however, it is the second tier which is the most beautiful. A quiet and tranquil spot which is also ideal for avid birdwatchers, you’ll more than likely have the place to yourself. Truly among the most spectacular waterfalls in Thailand! Our last waterfall on the list is so impressively huge that it looks like something out of a movie! At 260m tall, it is comprised of avalanches of white water, chaotically gushing over a vast mossy mountainside. 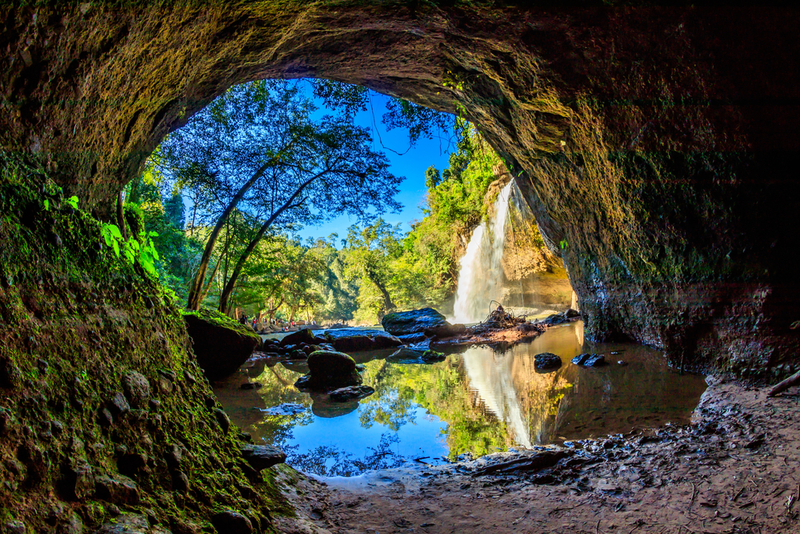 Arguably the most gorgeous of its kind in Chiang Mai, this is still among the hidden waterfalls in Thailand – like many of the others, it still boasts relative immunity to the world of tourism. Spanning across the rocks in a triangular fan-like shape, it oozes texture and character. The perfect place for adventurers to snap up some scenic shots for their scrapbook! Enjoyed this article? Why not explore our ultimate guide to luxurious travel in Thailand and start planning your stay now!